OWINGS MILLS, MD — On Thursday, March 12, Stevenson University announced that Baltimore Ravens coach, John Harbaugh, will be the keynote speaker for the graduation ceremonies to be held on May 21 at the school. This is a ticketed event for Stevenson graduates, family and friends only. Source: Carroll County Times. Photo shows Ravens coach John Harbaugh speaking at MD FCA Banquet in 2013. In 2013 Harbaugh gave a motivational speech to Stevenson’s men’s lacrosse team prior to its Division III national championship in 2013. 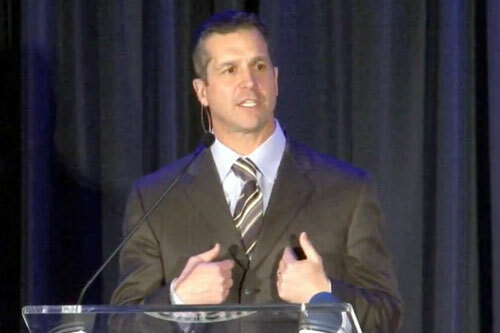 Watch John Harbaugh speaking at MD FCA Banquet in 2013. John Harbaugh is currently the head football coach of the Baltimore Ravens who won the Super Bowl in 2013. He also served as Eagles special teams coach for 9 years. If you would like to book professional athletes or coaches like John Harbaugh for a speaking engagement, autograph signing, product endorsement, fundraiser or special event, contact John Harbaugh’s booking agent for appearance and speaker fees at Sports Speakers 360. For booking agent information on how to hire Baltimore Ravens players for appearances, call 1.855.303.5450.